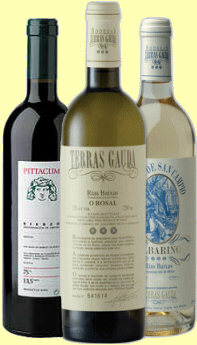 Though formed only in 1989, the company Terras Gauda has developed a worldwide reputation for the quality of its wines, particularly those from the Rías Baixas region of Galicia in northwest Spain. Founder José María Fonseca, inspired by the region’s ‘upgrading’ to full DO status in 1988, focused on the Albariño grape. From the outset the company pursued excellence in its vine material, establishing an experimental site with 115 Albariño clones, studying their growth and quality and carrying out individual micro-vinifications to establish the ideal clones for their soils, the programme not being concluded until 2005. The company’s vineyards and winery lie in the O Rosal Valley on the banks of the Miño River (above). This is an area of mild temperatures with an annual average of 15ºC, very little frost and abundant rainfall. Albariño is not the only variety however, as other indigenous varieties including Loureira and Caiño Blanco are also grown and blended in some of their Rías Baixas bottlings. The latter grape is particularly interesting as it is an ancient variety ‘recovered’ by Terras Gauda’s research team and now the basis of their premium ‘La Mar’ bottling. Terras Gauda also owns a second winery called Pittacum in the nearby Bierzo region – currently a very hot property with many wine lovers discovering the excellent red wines from the Mencia grape and white wines from the Godello grape, that are the signatures of the Bierzo region. Pittacum has its own vineyard and has others under contract, but uses only old vines (50- to 80-year-old) and red wines made from Mencia is their main focus. The company has recently completed the acquisition of a third wine estate, Quinta Sardonia, on the border of Ribera del Duero in Castillo y León. Terras Gauda recently sent me a selection of their Rías Baixas, Bierzo and Castillo y León wines to taste, including the new ‘La Prohibición’ from Bierzo, made from Garnacha Tintorera, a grape with a long tradition in the region.